Quick Breakfast Kolaches by Double B Foods — I Am Tired of Cooking! 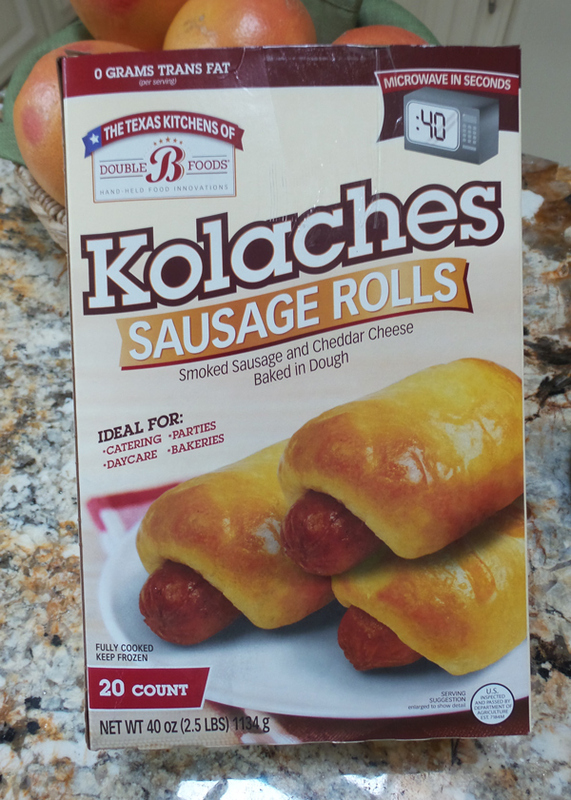 Kolache sausage rolls by Double B Foods is your answer to those crazy mornings or those after game drop ins when your child returns with "surprise mom" 5 friends. One kolache is ready to enjoy after only 30-40 seconds in the microwave. Want to make 4 or more? Just heat for 2 minutes. The smoked sausage has the cheese in it. Sausage can be tricky, sometimes too spicy and sometimes too salty, but this sausage would make Goldilocks proud because it is just right. The dough is soft, but not at all soggy and has a nice texture. The fully cooked kolaches are individually wrapped and come 20 to a box. The box I bought had a sell by date for 11 months in the future. At a cost of $9.99 per box at Costco, it comes to .50 per kolache, which is a good deal. They are great for breakfast, snack time or for anytime you are Tired of Cooking! If you want information about becoming a Costco member, visit costco.com for more details.